news Rumours flying around the telecommunications industry have named second-term MP and former corporate lawyer Michelle Rowland as having picked up the role of Shadow Communications Minister in Bill Shorten’s new Labor Shadow Cabinet, leaving more high-profile candidates such as Kate Lundy and Ed Husic out of the running. Earlier this week, newly elected Opposition Leader Shorten announced Labor’s new list of politicians that would constitute its front bench, but without allocating specific portfolios. Left off that list were the two most obvious, experienced and qualified candidates to oppose Communications Minister, being Senator Kate Lundy and MP Ed Husic, both of whom have consistently demonstrated a strong interest in the portfolio over the past decade and more, as well as having recently held junior roles in it under Kevin Rudd’s short-lived pre-election administration. Lundy has also held other roles in Opposition in the portfolio dating back to her first entrance into Federal Parliament in 1996, and has long been seen as the logical successor to Stephen Conroy to lead Labor’s efforts in the area. On the list were other candidates with a history or interest in the portfolio, including Sharon Bird, and former deputy Prime Minister Anthony Albanese. However, this week Delimiter has been told by several sources that the politician’s circulating in the telecommunications industry is that of Michelle Rowland. The Financial Review also this morning named Rowland as the likely next Shadow Communications Minister. Unlike Husic and Lundy, Rowland has had very little profile in the telecommunications industry or the National Broadband Network debate over the past three years since the politician first entered Parliament in 2010. However, the politician does have some experience with issues in the sector that will aid her if appointed to the Communications portfolio. From March 2011 through November 2011, and from August 2012 onwards, Rowland sat on the joint Parliamentary Committee into the National Broadband Network. 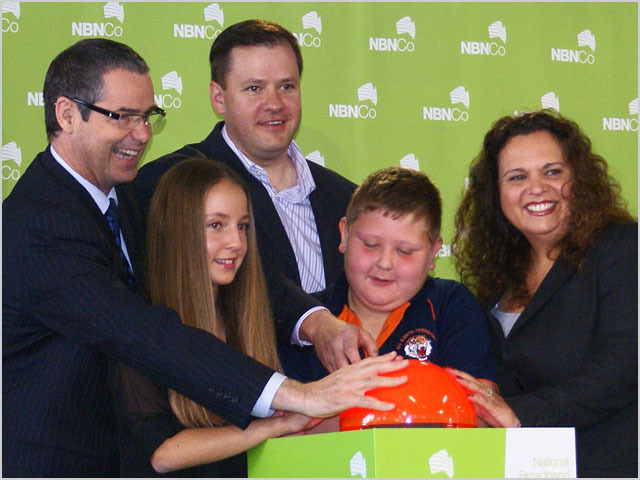 In July this year the MP attended a launch of the NBN in Blacktown in her electorate, alongside Husic and Conroy (pictured above). In addition, before entering Parliament, Rowland was a senior lawyer with Gilbert + Tobin, a law firm known for its speciality in intellectual property and technology law in Australia. Her website states: “Prior to her election she was a senior lawyer, specialising in competition and regulation in telecommunications, media and technology sectors.” “Rowland is very smart, very hard working, and has a communications regulation background,” wrote Technology Spectator commentator James Riley on Rowland this week. Rowland’s other experience, however, is not as relevant to the portfolio. The politician was a director of the Western Sydney Area Health Service from 2000 to 2004 and is a former local Councillor and Deputy Mayor of Blacktown. The MP, who is 42 years of age, was born in Blacktown and raised in Seven Hills. Rowland was educated at the Our Lady of Mercy College in Parramatta, as well as at the University of Sydney. Rowland won the seat of Greenway at the 2010 Federal Election — the seat which Ed Husic failed to win in 2004 earlier in his career, before he eventually won the neighbouring seat of Chifley in 2010. However, Rowland only won the seat on the slimmest of margins — 0.9 percent — which improved only marginally in this year’s Federal Election after the Liberal candidate, Jaymes Diaz, who was expected to win the seat, imploded on the campaign trail and was unable to name the Coalition’s plan to stop refugees from entering Australia. If Rowland does take the post of Shadow Communications Minister, the MP will be going up against sitting Communications Minister Malcolm Turnbull, who has been campaigning on the issue of the NBN for the past three years, and against the admission by former long-term Communications Minister Stephen Conroy that the previous Labor Government bungled the NBN build by severely underestimating the difficulty of the rollout. However, Rowland will be able to count on popular public support for Labor’s version of the NBN, demonstrated through a series of polls over the past several years, as well as a recent record-breaking number of signatures relating to the issue in a petition on Change.org. A stronger groundswell of public support for Labor on the issue has emerged following the Federal Election. Smart choice. Promotion of merit and qualifications over political celebrity and popularity. Rowland worked as a telco lawyer and knows the industry. Unlike Conroy she can manage to put a whole sentence together without putting both feet in her mouth. A friend told me that Rowland was one of only 2 Labor MPs nationally who recorded a positive swing to her in the Sept election – more than a “marginal” improvement I say. How is it I’ve never heard of her being active in it, then? And sure, happy to watch those videos, but which particular ones are you referring to? Senator Conroy told confidantes he doesn’t want the portfolio. “If Conroy had a say in it at all, he’d back Michelle,” one source said. But Senator Conroy, a powerful factional leader in the Victorian right, is understood to be negotiating behind closed doors for Ms Rowland to be offered the role. So it would seem that Conroy is pushing for Ms Rowland to be the new Shadow Communications Minister in Bill Shorten’s new Labor Shadow Cabinet. Anyway all will be revealed tomorrow I guess when Bill Shorten’s new Labor Shadow Cabinet is rumoured to be revealed. After watching those videos, I’m convinced Michelle would make an excellent shadow communications minister. Personally I would have liked to have already learnt how active she has been in commenting on, promoting and defending the NBN (particularly its regulatory framework) in the article itself, but that’s the benefit of an open comments system: readers can submit complementary and remedial information. I agree with John’s point that the article would benefit from additions and amendments in light of these facts. I think very few journalists had been aware of her interest in the portfolio — certainly I wasn’t. However, I’m planning an extensive Delimiter 2.0 article on Rowland tomorrow. I’m surprised Conroy isn’t back, despite early gaffes he did adapt to the portfolio very well and sold his department’s initiatives very well. But maybe they want to make a clean break, or give him a more senior portfolio. After six years as Minister he’s had enough of Comms. Oh dear, another one focusing on Labor. What about NBNCo appointments by Turnbull? Ex-Telstra members?